The new home of Aptsandlofts.com, next to developer Brookland Capital on Malcolm X Boulevard. BEDFORD-STUYVESANT — A real estate firm that last month called Bed-Stuy "the new Williamsburg" is expanding its operation into an upscale Malcolm X Boulevard office, and using the late civil rights leader's name as part of an advertising campaign to hire new employees. 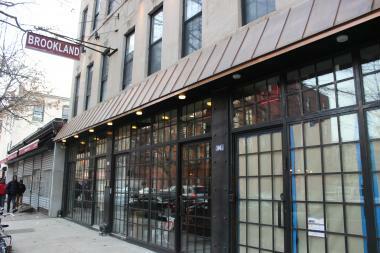 Aptsandlofts.com, which currently boasts a $1,450 two-bedroom apartment as its cheapest rental in Bed-Stuy, will open its 2,000-square-foot office in January. The building will be stocked with amenities including a furnished outdoor space with barbecue grills and a koi pond, according to the company. In a bid to hire new employees for their 306 Malcolm X Boulevard office, the firm came up with an ad campaign that plays off of the street's namesake, as Gothamist first reported. "X MARKS THE SPOT," is emblazoned across the top of the ad, with a map highlighting Malcolm X Boulevard, and the word "BedStuy" written in cursive. A spokeswoman for Aptsandlofts.com did not respond to requests for comment. The new office will support 45 agents and support staff, according to the New York Observer. Aptsandlofts.com will join neighbor Brookland Capital, a development company that opened earlier this year.